Keys are a funny thing. We all have them, we run around with them, and quite frankly we throw them all about the place. Bottom of our backpacks, on the table, in the drawer. Yet you lose them and all hell breaks lose. You retrace your steps. You empty your backpack onto a desk. You call reception. You report it to lost and found. Keys. Definitely cannot live without them. Despite all the technological advancements though, backup keys have only ever been done in a shop. You take your keys in, and they make spares for you. Fairly basic, right. However, seems a bit outdated for the online and digital world we live in, right? Fast Keys had a better idea. While they cannot do everything a traditional shop does, they have bridged the gap as much as possible, without having to leave the comfort of your home. Keys such as office keys, desk keys, cabinet keys and safe keys can be made as long as you have the right numbers and make for your locks. 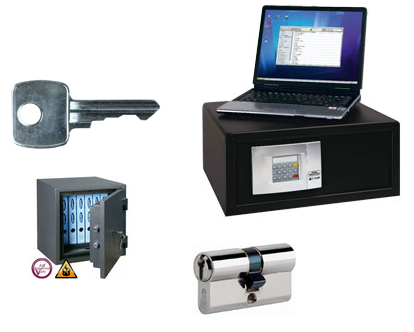 Offering safes such as fire, wall, security and floor, etc. A Fire Safe is a safe that is fireproof. Whether it be important paperwork, files or back up drives, a fire safe is the one way to make sure that even in the case of a disaster, your important items are safe. Of course, having the option of a lock on the door means that it really isn’t just about the fire, and you can ensure your items are safe on a day to day basis too. Starting at around £200, they feature electronic entry system, and are rated for up to £10k in cash and valuables up to £100k. They may run on battery, but have an extra key to allow you to enter just in case the batteries die. A Laptop Safe takes the one above one step further. Featuring the same digital electronic safety system as fire safes, they take the system one step further by focusing on laptops and paperwork as your valuables. These feature an inner cavity that is particularly designed to keep your laptop safe. Features include electronic lock, ability to fix it on a wall or inside cupboards and desks, and it also comes with emergency keys just in case the batteries run out. These start at around a £100 and are rated up to £10k in case of any problems. Personally any workplace I have ever been has always used one of the items above to store backup data as well as laptops and other valuables over night as well as during holiday periods. The cloud may be useful, but nothing beats having your data right where you know it.